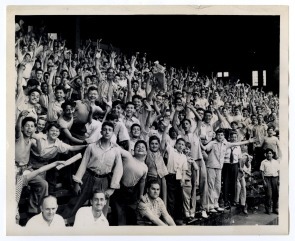 While Edith served with the WAVES during World War II, these kids cheered on baseball back in Philadelphia. By the early twentieth century, Philadelphia’s industrial base had transformed the northern parts of the city into a hub. The city established rail lines to transport passengers and freight quickly. Neighborhoods of row-homes and wealthy estates sprang up to house workers and captains of industry. Shopping districts and restaurants thrived as the population grew. 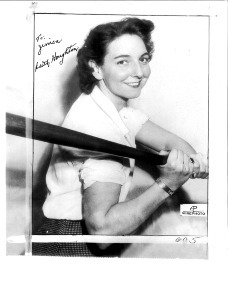 Amid these changes in North Philadelphia, a girl named Edith Houghton (2/10/1912-2/2/2013) was practicing baseball and forming lasting bonds in her new neighborhood at 25th and Diamond Streets. Around 1917, Edith moved with her parents and nine older brothers and sisters to their brand-new house at 25th and Diamond. 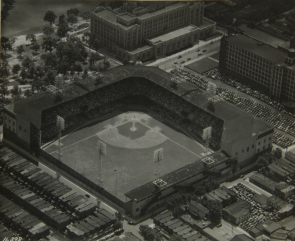 Directly across Diamond Street there was a large park with walking paths, benches, and a baseball diamond. When the diamond was free, the kids in the neighborhood would start a game of baseball. The first position Edith played was shortstop, but the kids took turns at all of the positions in the diamond in the park. Edith knew all the neighborhood kids. In 1925, when Edith was 13, the Bobbies travelled to Japan to play all-male college and semi-pro teams. 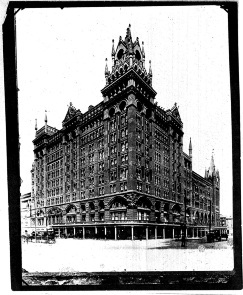 On September 23, 1925, they boarded a train at the North Broad Street Station, several blocks from Edith’s house. Twelve Bobbies, their coach, and two men (to play pitcher and catcher) played eight games on their way to Seattle, en route to Yokohama, Japan. Once in Japan, they drew large crowds, especially at first. Edith impressed many Japanese reporters. Although they were contracted to play fifteen games for $800, their finances fell through midway through the trip. Half the team headed to Formosa and back to the United States. The other half, including Edith, stayed in Kobe and luckily found a contributor to fund their trip home by December. Amid all this baseball, Edith remembers other notable events in her neighborhood. Often the circus set up in the park across from her house. As Edith reminisced, “We watched the circus come to town. We saw my uncle driving one of the horses! They all came into the park and set up near the baseball diamond. 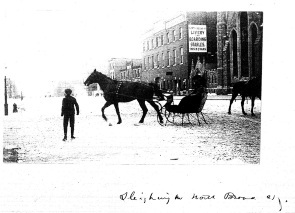 They walked the horses down 25th Street to water them.” When she was about 5, a bad storm struck Philadelphia. Edith watched the downpour from her window. Soon she saw their neighborhood’s delivery truck with ice, milk, and eggs stuck in a hole under the nearby railroad tracks. It was in a low spot across from a cemetery where runoff from the surrounding streets flowed. She remembered the soil being so loose it couldn’t absorb much water. The deliveryman tried in vain to free his truck and horse. Her family brought him inside the house to dry off. She recalled that she wished he had knocked on doors for help unharnessing the horse, but she didn’t remember him doing so. She and her brothers went outside after the storm to see the damage. To her horror, the horse had drowned. This early memory stuck with Edith her whole life. As a teenager, Edith spent less time in her neighborhood after her dad bought her a two-seater Ford. She briefly attended the new Simon Gratz High School, which had many sports, like hockey, that she wanted to play. 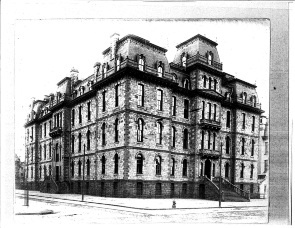 After 6 months, however, she went to Philadelphia High School for Girls, or Girls’ High, on Spring Garden Street. She advanced in many sports, especially tennis and volleyball, but always preferred baseball. 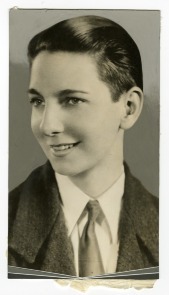 Edith went on to play for semi-pro baseball teams until she started softball in the 1930s. At that point women were pushed out of baseball into softball. Edith disliked softball but got the hang of it. As she described it, “I had never played softball prior to that [when she played in Madison Square Garden for the New York Roverettes in the 1930s]. I like baseball. A woman’s hand is much smaller than a man’s. The softball was too big to catch and throw for a woman.” Nevertheless, Edith shined on the field. 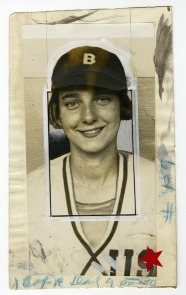 In 1942, Edith joined the WAVES baseball team (Women Accepted for Volunteer Emergency Services) during World War II. After the war, she took her skills to a new level. She once told me, “If I thought I could do it, I’d go after it.” And go after it, Edith did. She approached Phillies’ owner Bob Carpenter in 1946 asking for an interview. As she put it, “He looked at me like I was nuts.” At first, that was. With the scrapbook her father had kept of her baseball achievements in hand, she met with Carpenter and General Manager Herb Pennock. Soon the Phillies made national news: they hired Edith Houghton as Major League Baseball’s first female scout. From 1946 to 1952, Edith scouted players and signed fifteen to contracts, mostly from Philadelphia-area high schools. 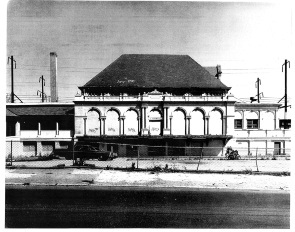 Edith lived at 25th and Diamond nearly the entire time from c.1918 to 1964. Here she learned many skills on and off the field. She temporarily resided elsewhere, as she travelled for baseball and softball. Diamond Street, however, remained her home base. In 1964, she moved to Sarasota, Florida, where she lived until her death February 2, 2013, just eight days short of her 101st birthday. Gregorich, Barbara. Women at Play: the story of women in baseball. San Diego, CA: Harvest or Harcourt Brace & Co., 1993. Houghton, Edith. Interviewed by Jessica Wade, telephone interview. 14 July 2012.